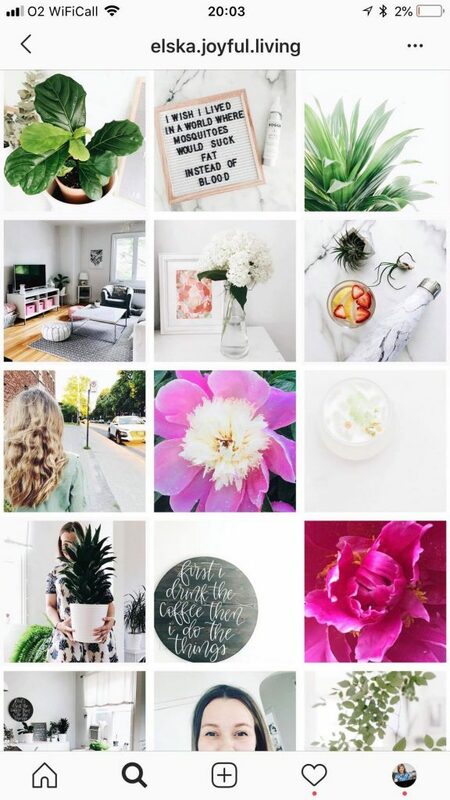 There are so many ways to make your Instagram feed look beautiful and engaging. 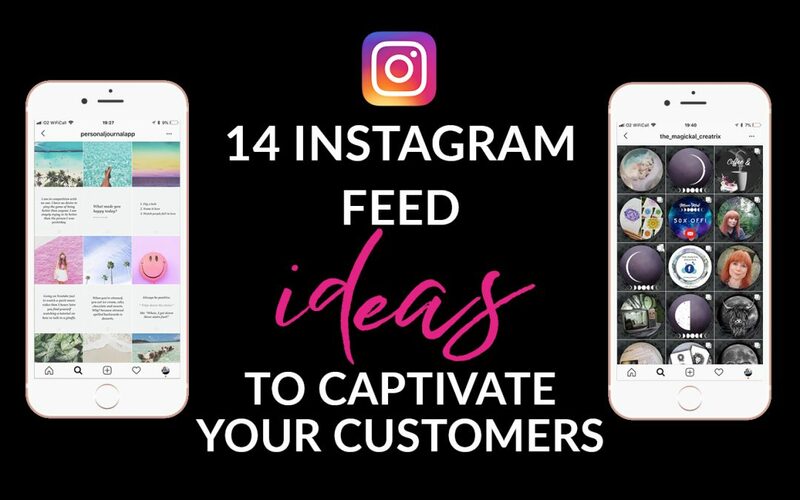 Today I am covering 14 Instagram Feed Ideas to captivate your customers. Let me take you back. 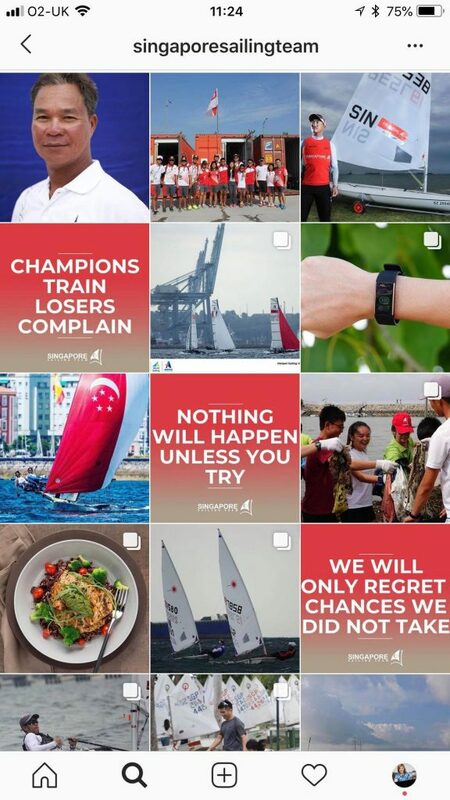 I was ploughing away at Instagram – posting religiously and posting some of my designs, some of my lifestyle, some advice and inspirational quotes – BUT I WAS BORED! And then I stopped posting and then I started again, then stopped and so the cycle continued. I knew my strategy was off – my Facebook on the other hand has always been on point – I get great engagement and I love creating for Facebook – Instagram on the other hand – it just wasn’t doing it for me at all – and I don’t know why either cause it’s such a great visual platform – exactly where I should be – but again I will make this point – I just wasn’t diggin’ it at all. Then, like a flash of inspiration, this all changed when the lovely Beckie Coupe from Infinity Digital sent me a wee message one day and said, “I can see this theme working really well for you.” With a link to someone’s Instagram – then another link that showed you the steps and how to do it in Illustrator. And BINGO! There it was – that rush of heart beats and a lightbulb moment – where I just KNEW that this was it for me! 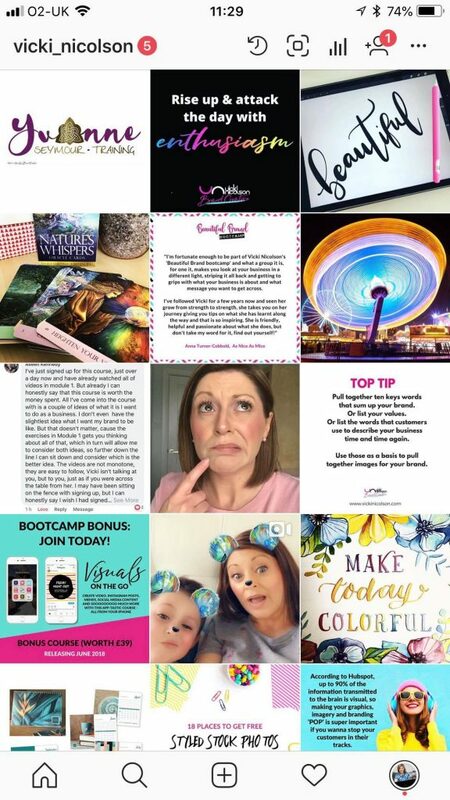 A themed Instagram grid – but not just any grid – a puzzle Instagram grid and I wanted to start straight away. I actually didn’t have a plan as such either, my Instagram grid idea and content for it just seemed to come quite organically. It felt so right. 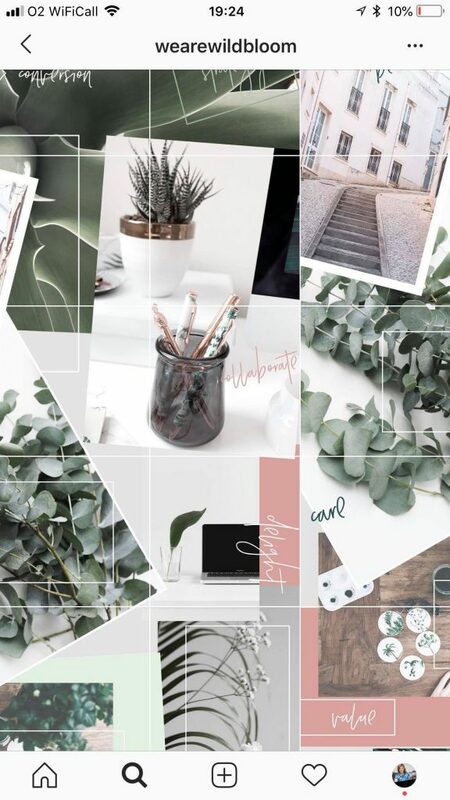 I refreshed a lot of my content from Facebook and downloaded some new imagery, and there you have it, my Instagram Puzzle Grid was born – and my goodness I absolutely adore doing it – I actually get excited when I sit down to create my new content for Instagram now. 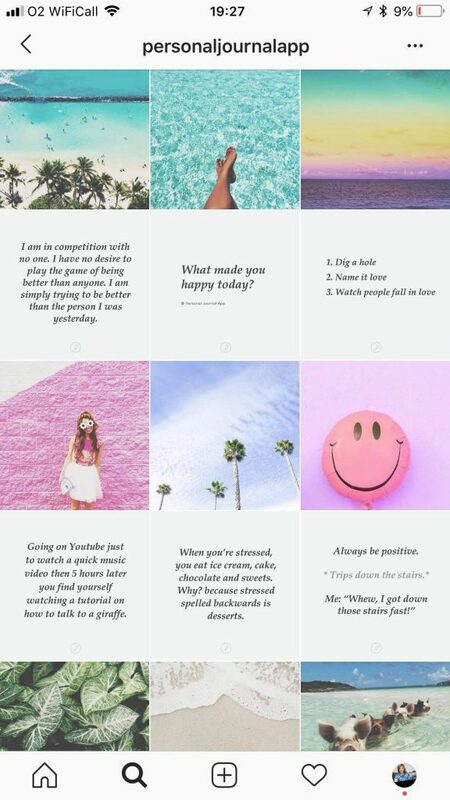 And hey, I know that my grid looks a little complicated and actually did initially take a great deal of time to design but there are so many other ways that you can have a beautiful Instagram grid. Coloured grids – 3-9 tiles all the same colour then changing to a different colour for the next 3-9 tiles so you get a really engaging sectional coloured grid where each block is a different and distinctive. 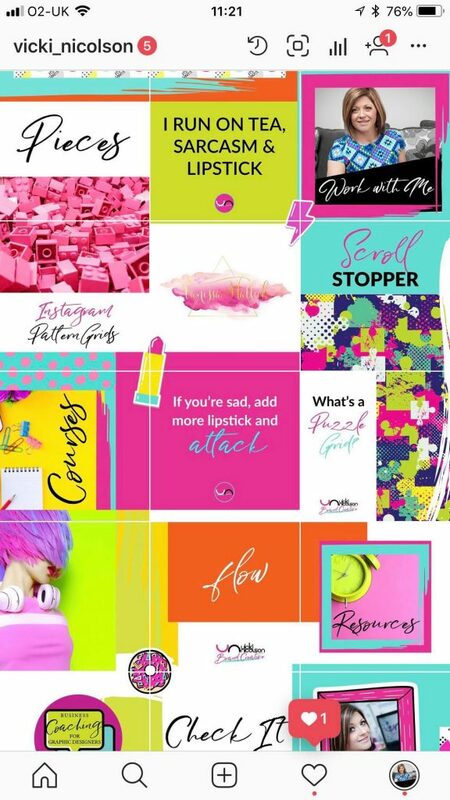 Diagonal grids – where your posts are positioned like a noughts and crosses boards – so maybe you have coloured posts or word posts on the diagonal or really strong coloured blocks on the diagonal instead – these grids have really strong visual styling. 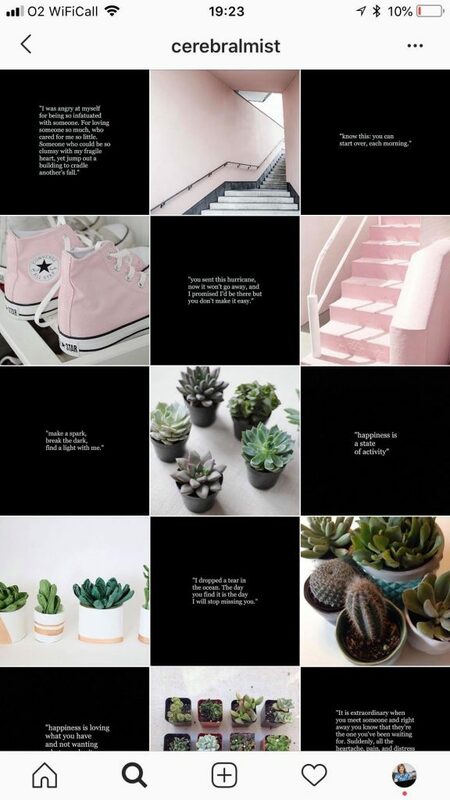 Chequered board – think chess board so you have mix of black and white – but in the case of an Instagram grid – light and dark. So each post pops. And each line is super distinctive. The pattern could go dark, light, dark and then the next line would be light dark, light. So when viewed in its entirety you get a gorgeous grid both horizontally and vertically. Puzzle grid – where the squares or posts, all fit together like a puzzle – or a jigsaw. 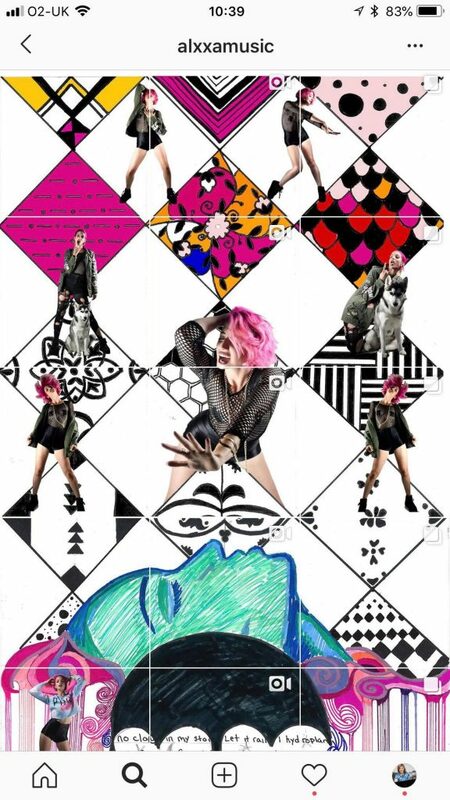 Some squares overlap, some spread into one another, some the photos overlay and cross over into several squares – how clever is that! These types of grids look incredible. 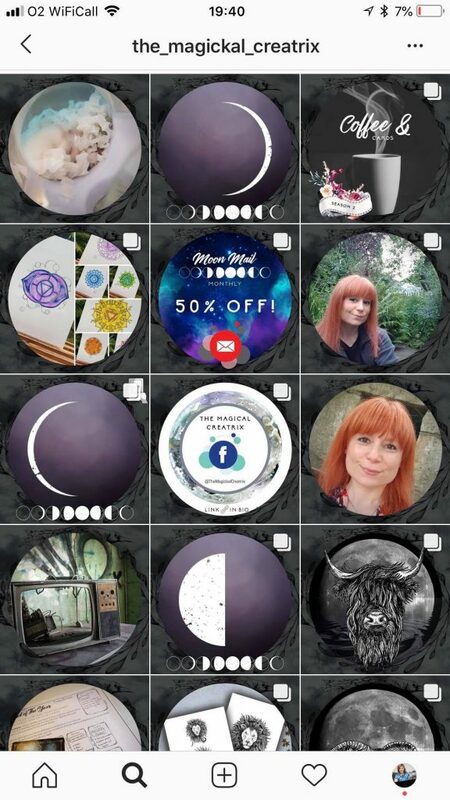 And this is the type of grid I have… So if you click on my profile here:https://www.instagram.com/vicki_nicolson/ and view my grid in its entirety, it looks incredible – but fun and always on brand. 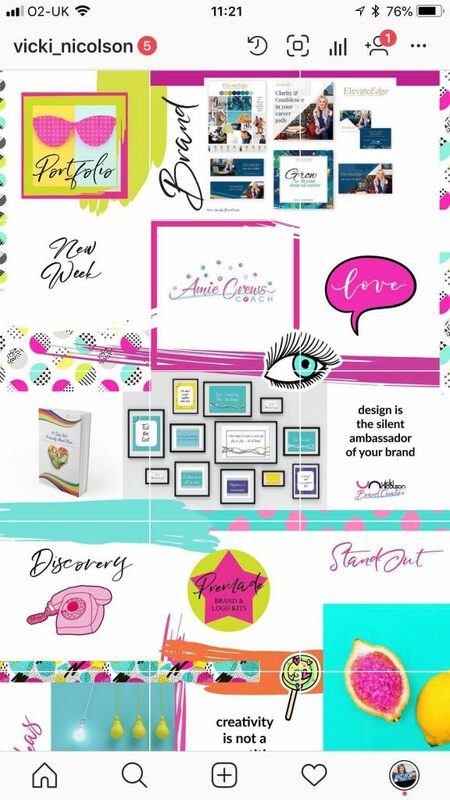 Not only does it allow me to showcase my products, courses, services and show off my latest designs – it’s also allowing me to be super creative and unleash this creative side of me – which I am and always will be. Each and every square has a purpose and I lead mostly with one or two words an let the imagery do the talking. Tiles – here you can mix very distinctive images and then written posts. So it would be image, quote/words, image and then the next line would be quotes/words, image, quote/words. So it looks tiled but also looks really clean and slick. 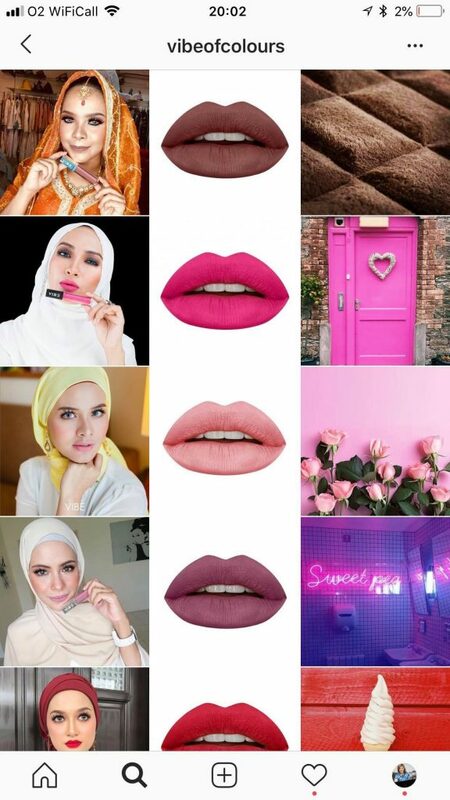 Rowed – it’s exactly that, row by row, it could be that each row is words, one row is images, one row is quotes, one row is one colour of your brand and the next is another colour of your brand. Again this type of grid looks really contemporary and spacious. Vertical – on this type of grid each square is positioned so that you have distinctive vertical lines… dark, light, dark or light, dark OR it could be image, quote/words, image and that’s what you stick to all the time. So when viewed fully your whole grid runs in vertical lines. Circles – it might be that you go against the grain and post image and words or quotes inside distinctive circles. What makes this so different is that it moves you away from the normal square post and really stands out on anyone’s feed. Also when your profile is viewed it looks incredible! Rectangular – each image is rectangular featuring more space above and below so the images look more panoramic. This also works if you place more white space on the left and right hand side of the images too instead of above and below drawing your eye into the middle of each image – so think either landscape or portrait. Triangle – Moving away from the standard squares again, this really will give you a very distinctive Instagram feed. Varying the direction of the triangles and placing images inside each once has an incredible aesthetic where no words are required. Black border – just like the white border, it works in the same way. And it gives the effect of having thicker borders when all the squares sit together. Combination – varying any of the Instagram feed ideas above throughout your whole grid, changing the theme every 3-9 squares. You could have heaps of fun with this as you may find you get bored of your theme after a while. You could mix things up a bit so you have fun and enjoy posting to Instagram this way. 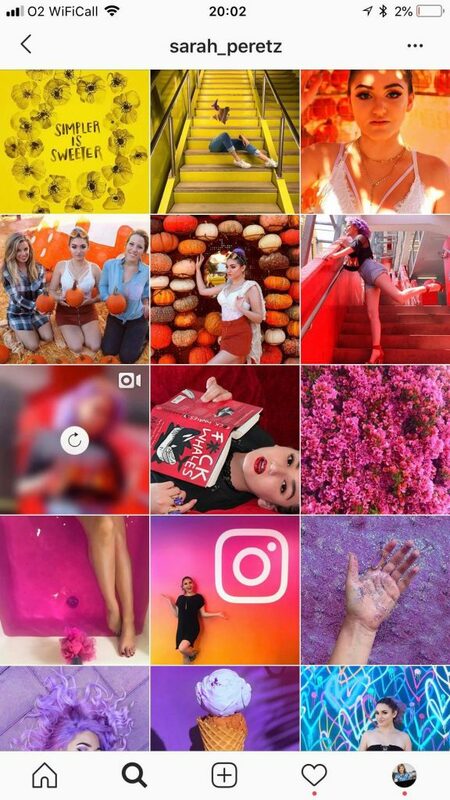 So why would you have a curated Instagram Grid? Because it looks super impressive and really creates an impact! 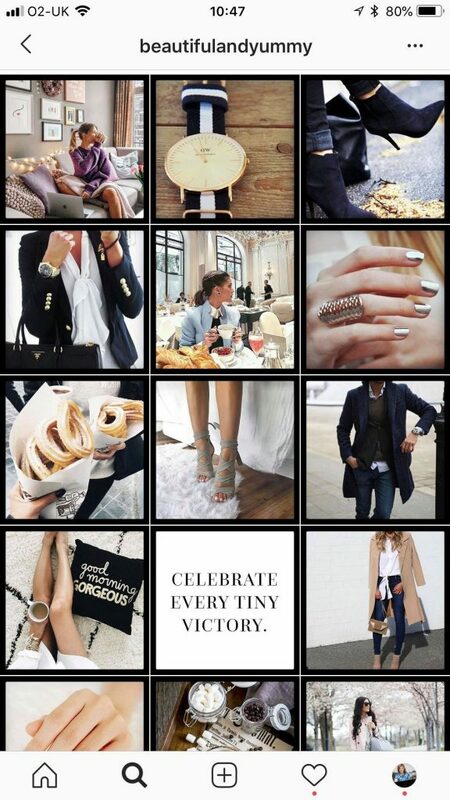 You can see that from the Instagram feed ideas above that they do create an impact. It looks impressive – that is the word and each tile has a purpose. It’s not flung together. It’s cleverly thought out and it creates that right first impression – you’ve taken your time to create something beautiful for your followers. 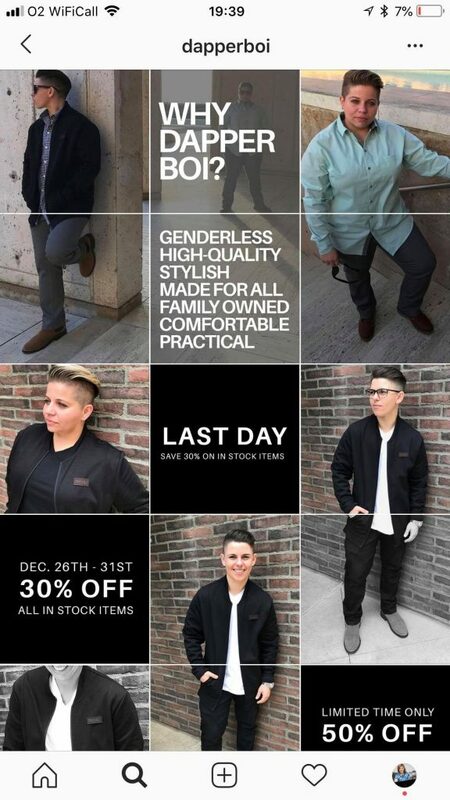 When a potential customer lands on your Instagram profile they are viewing your entire grid. What impression is it making? Is it the right first impression? Think of this as your shop front. You want to wow people so they notice you and your business and STOP them scrolling and visit your profile. 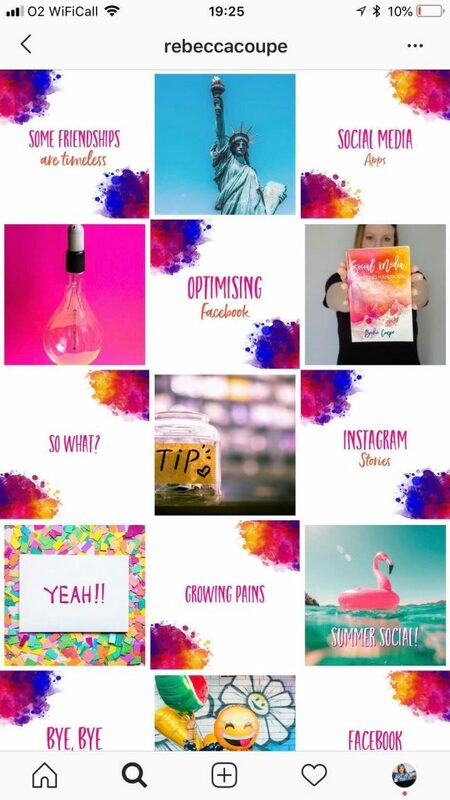 Standing out and create an impactful Instagram feed is the goal here, so that you can have fun whilst captivating your customers. If you take anything away from your read today, then the point I do want make is that it’s all about fun – have fun with your Instagram. If this article was helpful, please leave a comment below. Is there a way to alter your Instagram design to one l the above without havin to clog everyone’s feed with new posts?